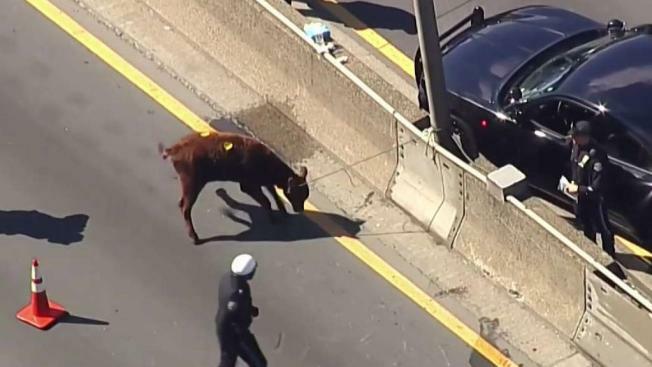 Once again, a cow has taken over the streets of New York City - this time running wild on the Major Deegan. Marc Santia reports. Once again, a cow has taken over the streets of New York City - this time running wild on the Major Deegan. Chopper 4 footage showed an extensive traffic jam Tuesday afternoon as NYPD officers tried to safely corral the cow. It was captured and tethered to a light pole in the highway median, though the agitated animal was at one point straining aggressively against the rope before being tranquilized. The runaway cow was first reported shortly before noon. A half-hour later, it was still swamping traffic as about a dozen animal and law enforcement officers surrounded the creature. By 1:15 p.m., the animal was finally in a trailer and being moved off the highway. Police say it escaped from a nearby slaughterhouse and ran onto the busy road near 166th Street. It was taken to Animal Care Centers of New York and from there the cow will head to Skyland Animal Sanctuary in New Jersey. The calf was checked out and is expected to be OK. The rampaging cow went on its escapade less than a week after a lamb got loose on the Gowanus and just two days after a rogue goat ran amok in the Bronx. Both of those animals were taken to live out their days at Mike Stura's Skylands Animal Sanctuary and Rescue in New Jersey. Stura says the cow is coming, too.